The PS4 controller equipped with the latest motion sensing technology, built-in three-axis gyroscope and three-axis accelerator. With the three features, it can detect omnidirectional dynamic information including Roll,Pitch and Yaw. and transmit all information captured to the game system quickly. 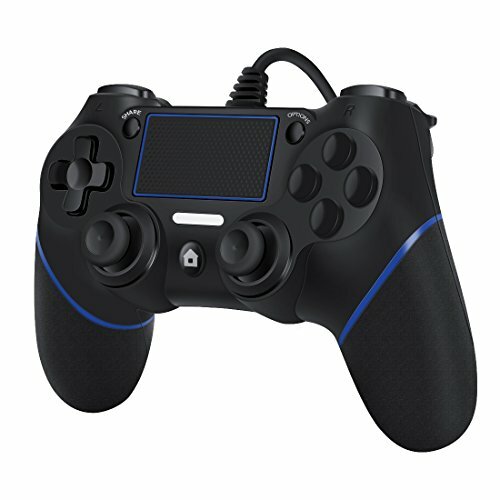 With this function, players can use this PS4 Dual Shock 4 controller to operate special games. It's also featured with a new function: dual-point capacitive sensing touch pad on the front of the controller. camera can determine the movement and distance of the controller. The controller can fulfill all function in PS4 games, including basic digital and analog buttons as well as six-axis sensor and color display function of LED. At the same time, regarding to certain games, it supports vibration function. The Controller is specially designed for PlayStation 4 console, adapting Dual Shock 4 wired controller program. [Omnidirectional dynamic sensor]: Equipped with 6-axis sensor which is composed by 3D acceleration sensor and gyro sensor. [Sensing touch pad]: Supports dual-point capacitive sensing touch pad and double motor vibration function. [Lower power consumption]: Connected with PS4 console via USB cable (1.9m), Lower power consumption, superior functions. [Note]: Don't included the Built-in speaker or Stereo Headset Jack function. When the PS4 is asleep, the USB interface is not powered, so the PS4 can not be woken up by the wired controller. If you have any questions about this product by LREGO, contact us by completing and submitting the form below. If you are looking for a specif part number, please include it with your message.